I own a very fat brown rabbit. When you bring out the camera, he'll stop, look at and and won't move until he sees the flash! I don't know exactly what kind he is. I think he has some standard chinchilla in him, but he's mainly brown, not gray. You KNOW you are in trouble when your dust bunnies have EYES!!! I know that ermine is not an accepted color in the French Angoras but to me it is gorgeous. This is Jack Frost one of my bucks. He is five months old here, His eyes are almost purple in color and he has the wool to DIE for. He is a true character and when I let him run on the front porch he spends most of his time chin rubbing my shoes. Little weirdo!!! What a wonderful dust bunny. Jack's color may not be cool in the Show world, but he is just perfect for you. Thanks for the pic. 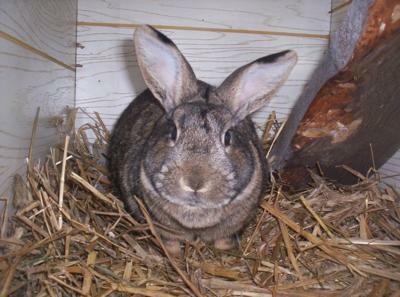 I have loved rabbits all my life and I breed Mini Rex's and other small Breeds. 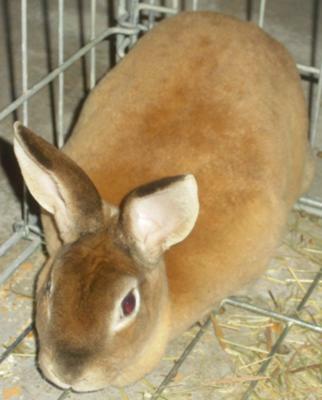 Coco is a 2 year old Mini Rex Doe, Chocolate color. She is an amazing Mother and Friend to others. She loves to run and play and the attention. I love her fur it is the most softest in the world. 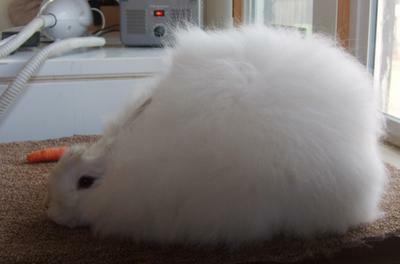 My web site is - http://www.natsrabbitry.ca/ come check out the site. A very nice looking doe - thanks for sharing! Thank you :))I will be breeding her in the next couple of weeks and I'm sure her kits will look amazing.